The one big issue with most of the popular smart speakers on the market is a serious lack of power. Google is aiming to pummel that issue with a sledgehammer in the form of the Google Home Max. It takes all the smart features of the Google Home combines them with massive power that’ll make your neighbors hate you. Google isn’t offering this thumping bass and piercing treble out of the kindness of its heart though: the Max comes with a $399 price tag. That’s more than double the cost of the standard Google Home Google Home Review Google Home Review Google Home is a personal assistant smart speaker, and comes from a company that literally knows everything. The $130 Google device answers questions, controls your smart home, and plays music. Should you buy one? Read More (which goes for $129). In terms of other options on the market, the first name most people will think of is Amazon, but there is no Echo model that is comparable. The top-of-the-line speaker from Amazon’s line is the standard Echo, and that comes with a $99 price tag (and is far less powerful). Instead, we need to look to Sonos to find the closest comparison in the Sonos One. Even that comes with a $199 price tag and less power than the Max. So it seems that if you want a smart speaker from a major brand with huge power, the Google Home Max is your only option (unless you want to add an Echo Dot Amazon Echo Dot vs. Echo: Why the Dot Is a Better Buy Amazon Echo Dot vs. Echo: Why the Dot Is a Better Buy There are a lot of smart speakers out there, but the tiny black or white Amazon Echo Dot is the only smart speaker you’ll ever need. Read More to one of the higher-end Sonos speakers to get voice control). Is a $400 voice-controlled speaker a niche that actually needs to be filled? We’re going to dig into what the Google Home Max can do and figure out whether it’s worth owning. Then at the end of this review, we’re giving ours away to one lucky reader! So now you know exactly what your big money is going towards. Those two woofers and two custom tweeters are what’s pushing the loud, high-quality sound. That processor lets the Google Assistant Google Assistant vs. Apple Siri: Which Is the Best Smart AI? Google Assistant vs. Apple Siri: Which Is the Best Smart AI? Siri may have been the pioneering voice assistant on a smartphone, but it’s been years since most of us took her seriously. Are other voice assistants simply better? Let's take a look. Read More do its thing, and the far-field microphone allows Google hear you from across the room (though that’s not always a perfect experience when music is loud, as we’ll get to later). The Google Home Max offers a very strong first impression. It comes in a nice box with a top that slides off. Once you dig in and check out the speaker itself, you can’t help but be impressed by its minimalist design. Just like the original Google Home speaker, there aren’t buttons and controls cluttering up the look of the device. Instead, there’s a simple slider that lets you manually adjust the volume or press play. On the back, there’s a small switch that lets you mute the microphone (for those times you’d prefer the omnipresent Google not keep an ear on everything you’re saying). You probably won’t find yourself using the slider to control things very often, as the real star of the Max is voice control, a feature we’ll dig into in a bit. Otherwise, it’s just the sleek lines of the speaker itself that carry the Max. For our testing, we went with the Charcoal model, but Google also offers it in the far lighter Chalk color. Both feature a slightly darker front, though the contrast is far more noticeable on the Chalk model than the Charcoal one. The other thing you can’t help but notice about the Max is the size. It’s a hefty speaker both in terms of size and weight. With those fairly large woofers inside, it makes sense that there’d be some serious mass. We’ll talk about the specific dimensions soon, but just be prepared to make space for this speaker as it’s not going to fit just anywhere like the original Google Home. Also included in the box is a 6.56-foot (2-meter) power cable, a little rubber base for the speaker, and some basic documentation to help you get up and running with the Max and Google Assistant. Out of the gate, the Max impresses in all the ways you’d expect such an expensive, high-end speaker to. It looks good, feels solid and well-built, and comes with everything you need in the box. Let’s talk about the actual design of the speaker itself before we dig into the sound quality. The Max is 13.2-inches long, 7.4-inches tall, and 6-inches deep. It pretty heavy, tipping the scales at 11.7 pounds. It dwarfs the original Google Home in all ways. While speaker technology has improved a great deal allowing smaller speakers to offer more power, if you want truly bumping bass, you need large woofers, and the Max delivers those in a form factor that’s as small as it can be. Google calls the material on the front of the Home Max “Acoustically transparent fabric.” That means that fabric on the speakers won’t alter the sound. You’re getting the most pure sound possible. Sound aside, the fabric has a nice look and feel, which is always a nice bonus. Google enclosed the rest of the speaker in a rigid plastic that controls the audio and keeps it composed. It feels quite durable (not that we’d recommend dropping your $400 speaker on the floor). Under the Acoustically transparent fabric are four lights that indicate that the device is listening, show the volume level, and so on. Using this design instead of larger lights on the top keeps the minimal aesthetic going. The Home will work on its side or vertically. A small rubber base moves depending on which direction your orient the speaker. I preferred the vertical look, but that’s just a matter of preference. If you put the speaker the wrong way, Google Assistant will let you know that it’s upside down. It will continue to work if it’s flipped over, but you won’t be able to access the touch panel and some of the mics will be blocked. Basically, you’re definitely better off flipping it over and using it the right way. When it comes to design, so much of it is subjective. If you like a busier speaker with brighter colors and designs, you won’t love the look of the Home Max. Personally, I really like the look. It’s simple and not at all flashy. The two colors offered won’t stand out and will blend with almost any decor. Audio quality is where the Max truly stands out. In the smart speaker space, you’re going to be hard-pressed to find another speaker that offers the same quality and volume that the Google Home Max offers. As we mentioned in the intro, the Max blows away any of its competition in the smart speaker space, and its real competition comes from non-voice-controlled speakers like the $499 Sonos Play:5 or the $499 Bose SoundTouch 30, which offer similar power and quality. In terms of quality, the Max is definitely on par with the more expensive traditional speakers, though it does fall short in small but notable ways. Some of the highs can be a little too high when played at max volume. They’ll actually pierce through the mix a little too much. Small negatives aside, I have to admit that I’m not what you’d consider an audiophile, and for my needs, the Max is easily one of the better sounding speakers I’ve ever used. Highs are crisp, mids sit comfortably in the middle of the mix, and lows certainly bump in the way you’d expect (though not with the same force as a dedicated subwoofer). Regardless of music genre, I always felt like I was getting a beautiful experience from the Max. The issue with Google Home Max, from a sound perspective, is that it’s a solution in search of a problem. True audiophiles are going to want a full range of speakers to deliver the sound they want, and casual music listeners aren’t going to feel comfortable spending $400 on a single speaker. Still, it’s hard to find anything wrong with the sound quality, and if you’re willing to drop the money, you’ll be quite happy with what you hear from the Max. If you want an in-depth look at the voice features of Google Assistant 9 Great Third-Party Amazon Alexa and Google Assistant Smart Speakers 9 Great Third-Party Amazon Alexa and Google Assistant Smart Speakers Looking for a Smart Speaker? There's no need to stick with the big brands, with the functionality, appearance, and price of these fantastic third-party smart speakers for Amazon Alexa and Google Assistant. 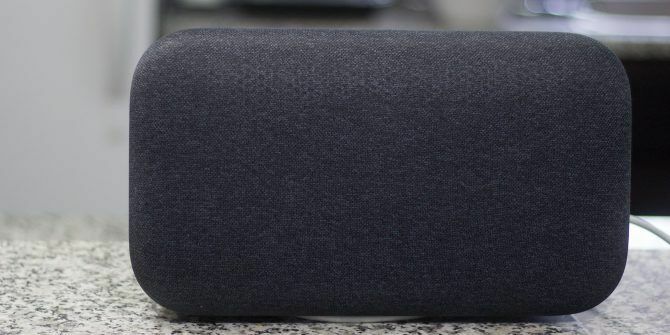 Read More , have a look at our review of the original Google Home speaker Google Home Review Google Home Review Google Home is a personal assistant smart speaker, and comes from a company that literally knows everything. The $130 Google device answers questions, controls your smart home, and plays music. Should you buy one? Read More . To keep it simple, I found that Google Assistant worked extremely well in my testing. It worked with my rather minuscule smart home setup for controlling my lights just as well as the original Google Home, and controlling music worked like a dream. Everything starts with “Ok Google” or “Hey Google,” and from there you can do all kinds of stuff. “Hey Google, play Daily Mix 1 on Spotify” launches the playlist based on the music you already like. “Hey Google, turn off the lights,” will cause your connected smart lights to turn off. Like any smart home device, there’s a bit of setup involved, as you’ll have to sync your Google Home with all of your different apps to get voice commands up and running, but that’s something you’ll only need to do once. Google does a great job of making the process as painless as possible. The only issue I had with the Max was having it hear me at loud volumes. Because it packs much more punch than smaller speakers, I definitely had to yell at the Max to get it to hear me over loud music. I didn’t have that problem with the original Home, as it didn’t have enough volume to create that situation. Not much has changed since our first Google Home review. Google added some new features, but at its core, it still functions in much the same way. And thankfully, it’s quite good once you get used to the idea of telling your speaker what to do. If you’re serious about sound (and spending large sums of money), you can actually link two Home Max speakers together for a true stereo experience. On its own the speaker bumps nicely, but as you can imagine, two offers a ridiculous experience that’ll be overkill for most people. While linking two Google Home Max speakers is a little excessive, the feature I did find quite useful was the ability to create a HomeLink where music is played across more than one Google Home speaker (I own an original Google Home). This lets you create a Sonos-like system where music is played in all different rooms in your home. One feature that was sorely missing when the Google Home first launched was the ability to use it as a standard Bluetooth speaker for playing music and podcasts through apps that don’t offer support for Google Cast. For example, my podcast player on iOS of choice is iCatcher!, and it only supports Bluetooth. Instead of having to seek out a new podcast app, Google Home now lets you connect through Bluetooth without worrying about it. Sure, you’re limited on voice commands, but that’s a trade-off I’m willing to make for Bluetooth support. So we come to the big question: should you buy the Max? At the end of the day, it’s a little too expensive to recommend it for most people. It’s just hard to find a real use case for Max. Are you going to have a loud party where controlling a speaker with your voice is preferable over just using your phone? Are you going to sit around your house blasting music at full volume? If you answered yes to those, than maybe the Google Home Max is for you, but for most people, it just doesn’t make sense. If you’re looking to spend $400, you can get two Sonos Play:One speakers for the same amount, and when combined, they’ll offer better sound than the Max. And if you’re a true audiophile, chances are that you’re going to want to invest in a full sound system compared to a single speaker. With that being said the Max still gets a high score because it delivers on all of its promises. It sounds great, looks gorgeous, and delivers intelligent features that work perfectly. It’s just hard to imagine exactly who it’s for. Explore more about: Google Assistant, Google Home, MakeUseOf Giveaway, Smart Speaker. The home is not bad for the price. It is similar to the amazon echo I guess. If you buy a house, you can purchase a Google home max to complete it. Or you can either go for an amazon echo.